Arianna Powell: plays a Fender Jaguar. 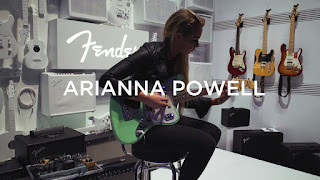 We asked one of our favorite guitar players, Arianna Powell, to play Fender's new Jaguar at NAMM. Arianna is an incredibly versatile guitarist who has performed with Black Eyed Peas, Chris Brown, Nick Jonas, Will.i.AM, Drake Bell, Zara Larsson, Zayn Malik and more. Arianna Powell plays a Fender Jaguar.